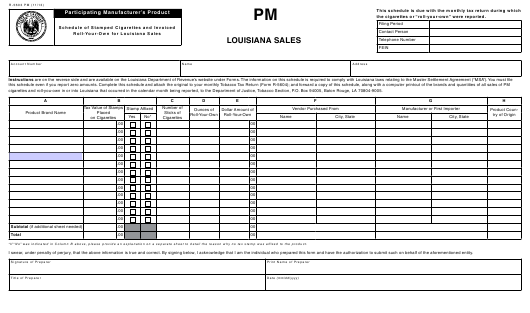 Form R-5603 PM is a Louisiana Department of Revenue form also known as the "Participating Manufacturer's Product - Schedule Of Stamped Cigarettes And Invoiced Roll-your-own For Louisiana Sales". The latest edition of the form was released in November 1, 2013 and is available for digital filing. Download a fillable PDF version of the Form R-5603 PM down below or find it on Louisiana Department of Revenue Forms website. cigarettes and roll-you-own in or into Louisiana that occurred in the calendar month being reported, to the Department of Justice, Tobacco Section, P.O. Box 94005, Baton Rouge, LA 70804-9005. *If “No” was indicated in Column B above, please provide an explanation on a separate sheet to detail the reason why no tax stamp was affixed to the product. roll-your-own in or into Louisiana that occurred in the calendar month being reported, to the Department of Justice, Tobacco Section, P.O. Box 94005, Baton Rouge, LA 70804-9005. Schedule 3, line 2 and 3 (for roll-your-own tobacco). You must file this schedule even if you report zero amounts on those lines. affixed. If no tax stamp was affixed by the reporting entity, please provide an explanation on a separate sheet. Column C – Enter the number of cigarette sticks for each brand listed in Column A. Column D – Enter the number of ounces of RYO for each brand listed in Column A. Column E – Enter the dollar value of each brand of RYO listed in Column A. Column F – Enter the name and address of the vendor from whom the product in Column A was purchased. Column G – Provide the name and address of the product manufacturer or the first importer of the product listed in Column A. Column H – Provide the country of origin of each product listed in Column A.